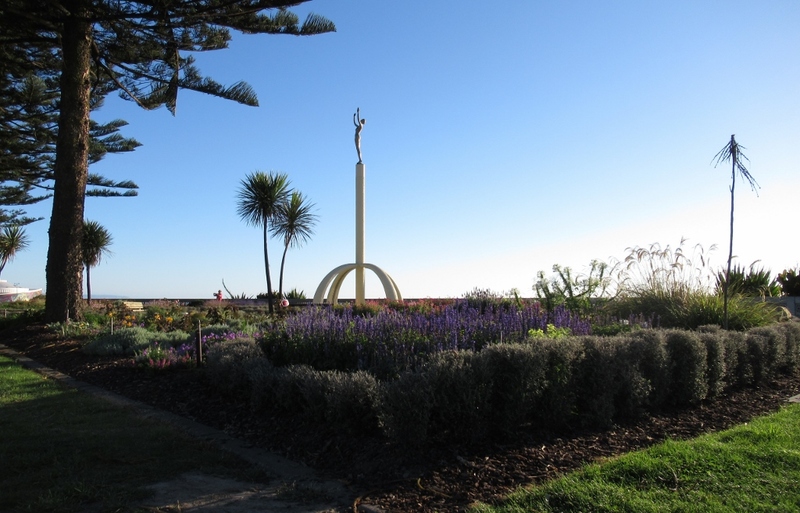 It is hard to imagine anything positive resulting from a massive earthquake destroying a town, as happened to Napier in 1931. 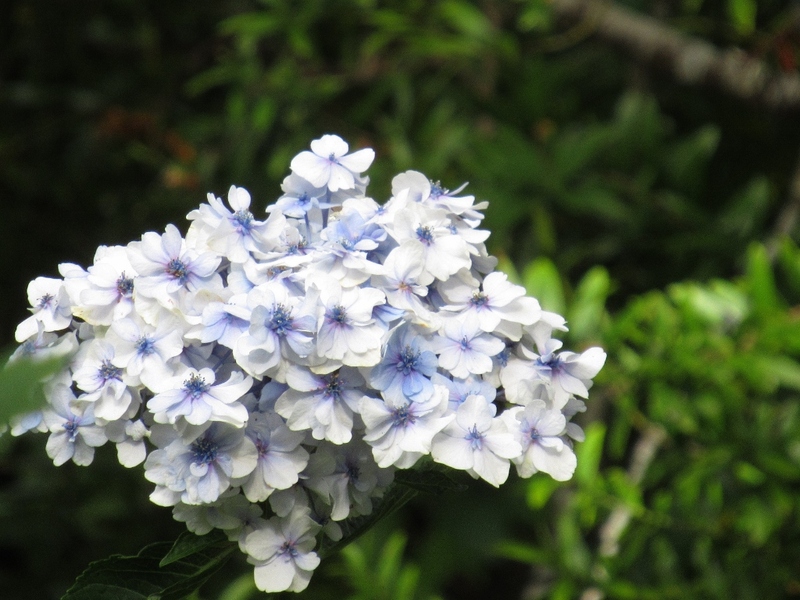 It is testimony to the New Zealand spirit, that they faced the destruction of their town, with 260 people killed, by starting again. 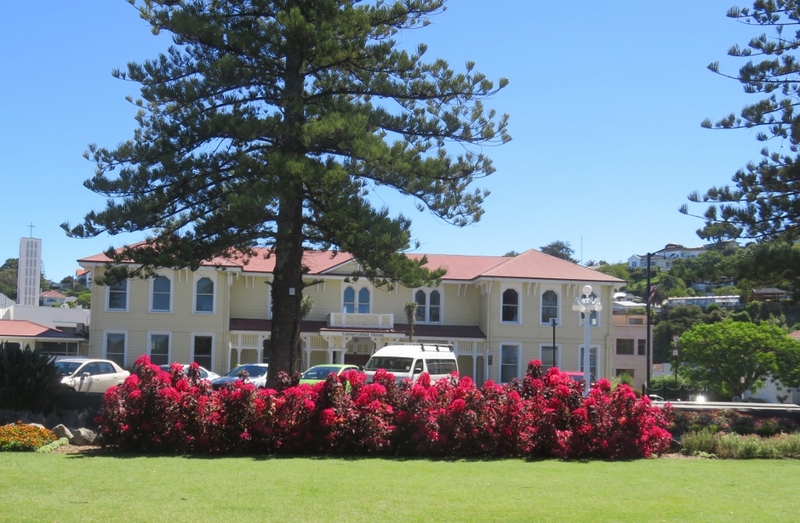 Napier is now a lovely seaside city on the east coast of the North Island with unique Art Deco buildings in the centre of the city, as was the style in 1931. The silver lining is a popular Art Deco festival held every year. 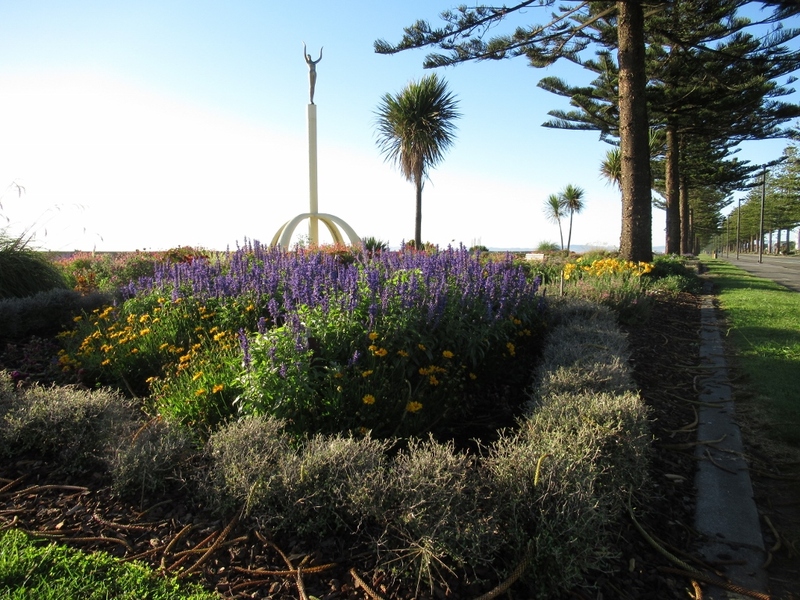 We have missed the festival, but we’re up early to walk along the Marine Parade Reserve. Ecliptic: Artist David Trubridge. To find the point where the sun rose at the start of the Millennium, follow a line from this rock through the centre of the arch to the horizon. The National Aquarium has a stingray-inspired shaped roof, and while we were there, a group of seagulls sat very still on the roof, no doubt enjoying the early morning sun as much as we were. 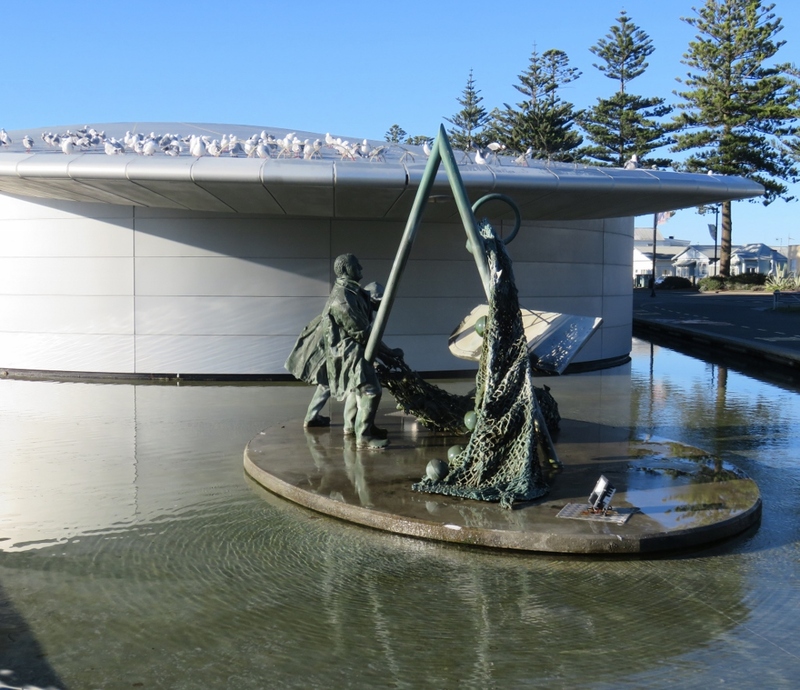 This life-like bronze sculpture is called Trawlermen, and is dedicated to the commercial fishermen who toiled at sea. The Trawlermen by artist Alan Strathern. He won an award for this sculpture in 1972. 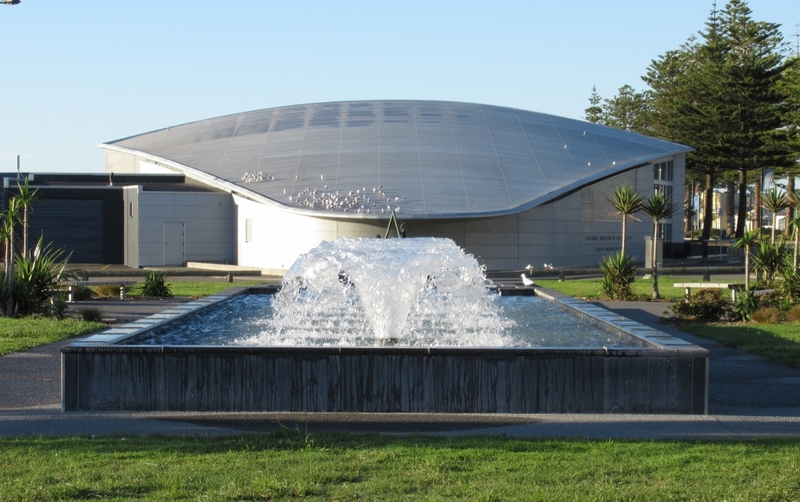 The aquarium has an impressive amount of fish, piranhas, terrapins, eels, kiwi, tuatara….and snorkellers can even swim with the sharks…needless to say, I’m much happier watching the seagulls. Further along is a wonderful statue, fountain and garden…even more special in this morning light. 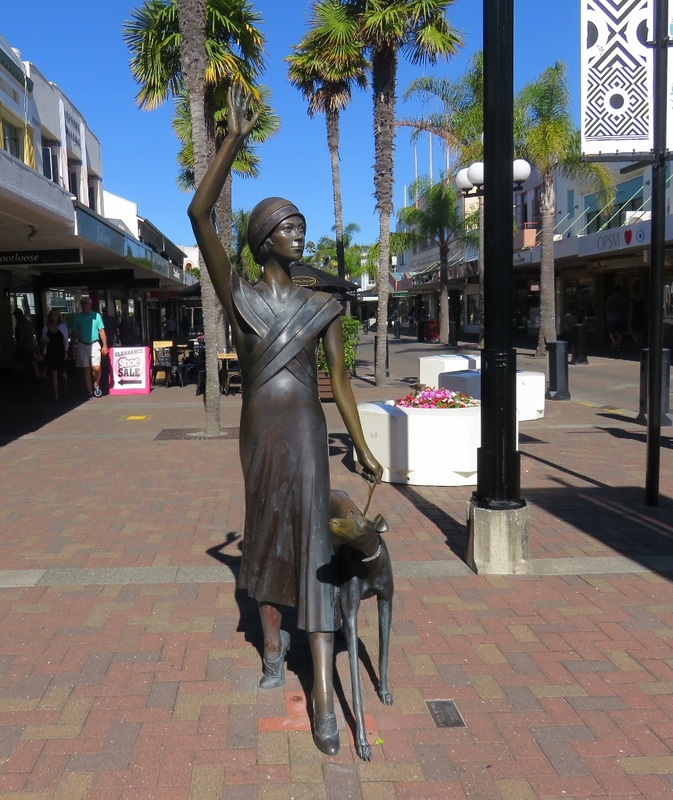 The statue, by Hungarian-born artist Franc Szirmay was inspired by the Art Deco period to design the form of an upward reaching young woman which represents Napier rising from the ashes in 1931. 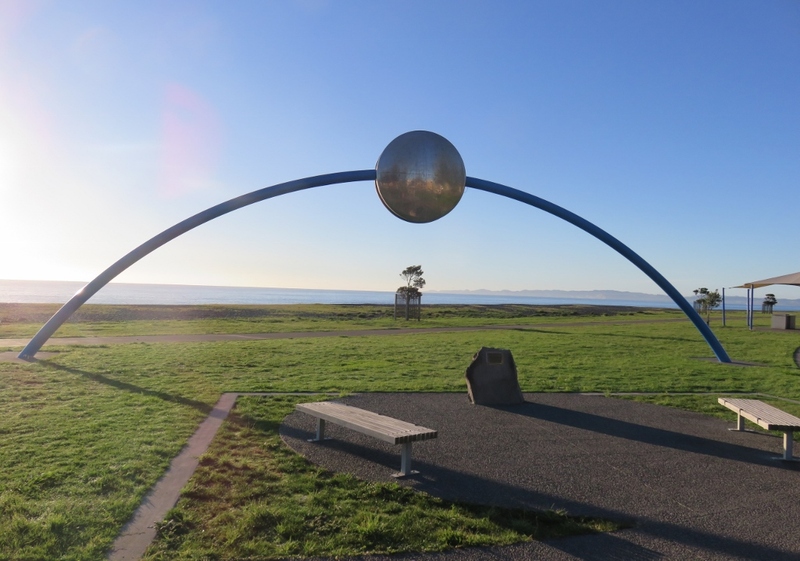 It is made in silicon bronze, and called ”Spirit of Napier”. At the base of the statue is a fountain, which is not turned on this morning….but is an eye-catching feature at night when it is lit up. 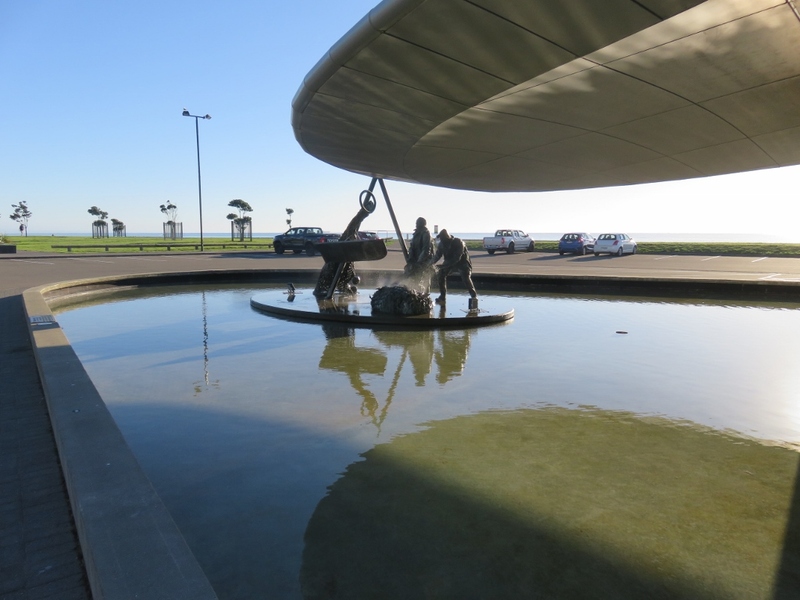 This sculpture and fountain are near the entrance to the city…a lovely welcome. …wish you could have been there.. 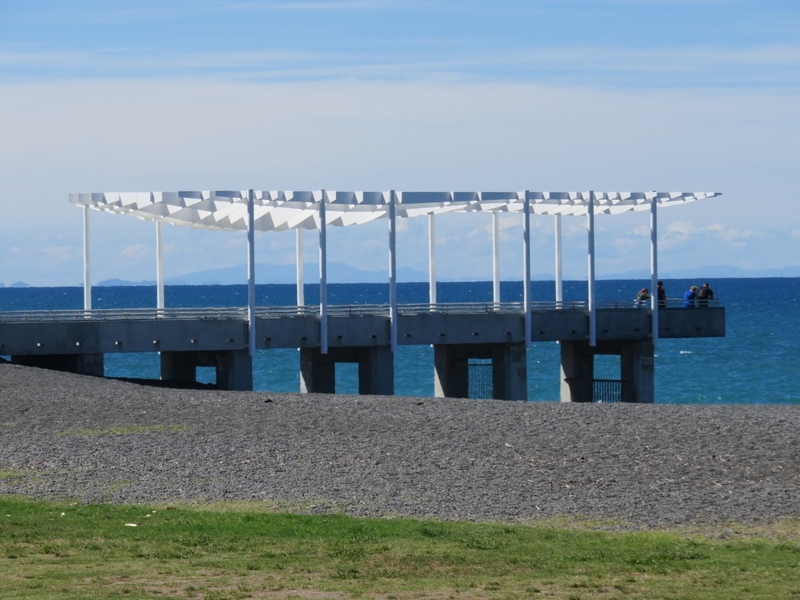 The sun was shining by the time we walked back along the Parade to the storm water outlet, and interesting jetty..
A great place to watch the cruise ships and tankers passing by..
Napier is a pretty city, full of gardens, trees and shrubs, and colour.. 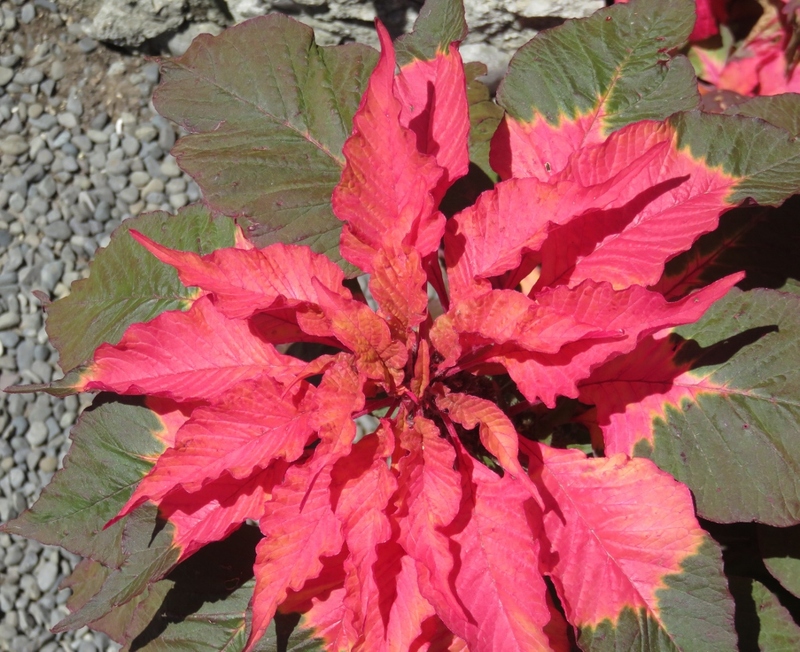 This flower looks as if it comes from the Poinsettia family, but I have never seen one with young red/pink leaves, and then older, green/grey larger leaves… perhaps someone knows the name of this one? 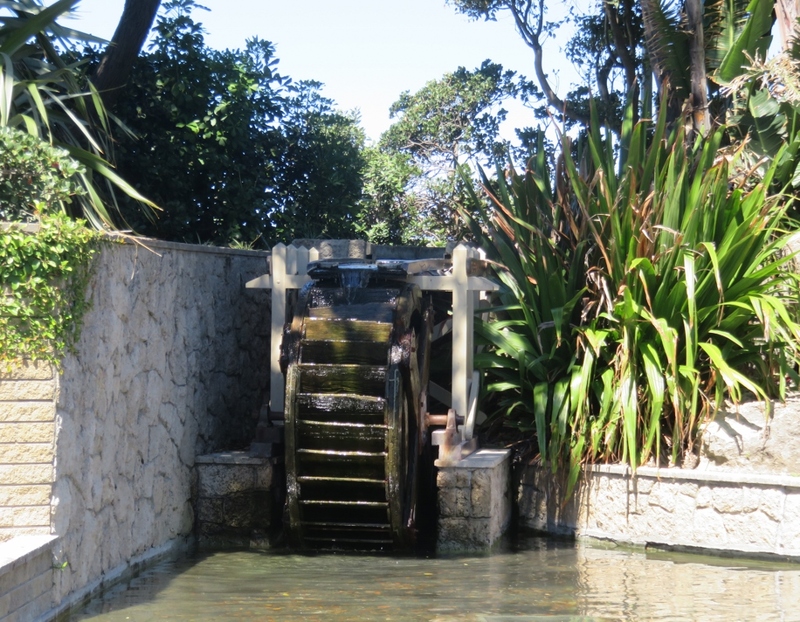 and a waterwheel built in 1911, owned by a farming family and donated to the garden by Mrs H Philip. It was first used on the farm to power the milk separator and butter churner, then it was harnessed for shearing, sawing wood and pumping water…and in 1915 it was coupled with a dynamo generating electricity for the next 15 years…….what an amazingly useful wooden wheel! 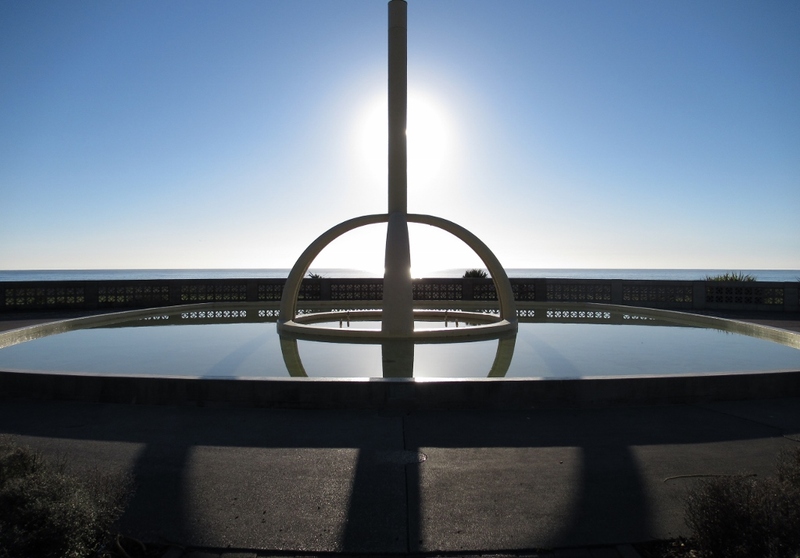 Napier’s Art Deco Festival is in February. During this time people dress up, drive around in vintage cars, and and enjoy a festive time ..
We had missed the festival, but, we hoped we hadn’t missed the fish restaurants… as we always try to sample some local fish dishes when we are at the coast. 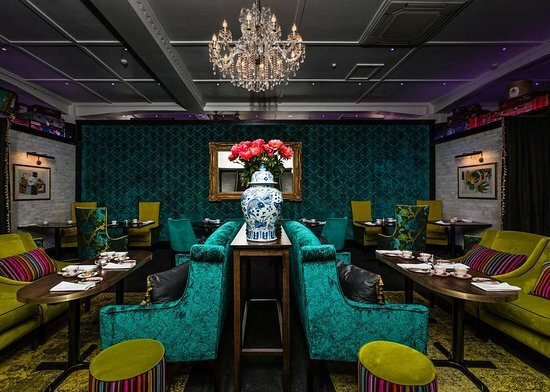 It was worrying to notice how many people were looking at menus in restaurant windows that evening, just as we were…. 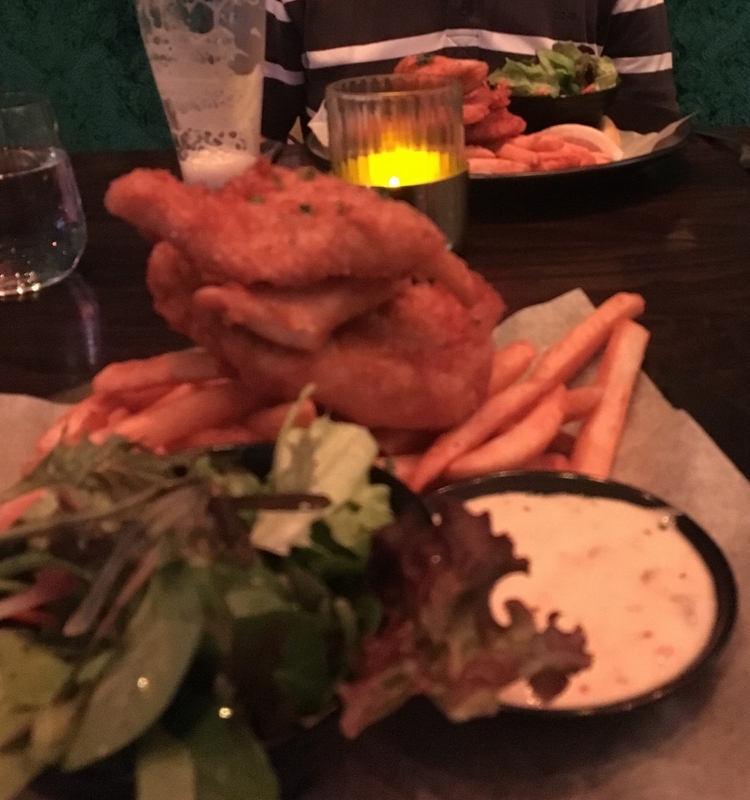 The fish restaurant we chose was booked out, (and that is the last time I’m going to be the one to hesitate) but we noticed very nice fish dishes being served in the Emporium, which is also a gastro pub. …how could I ask for such an impossible thing! 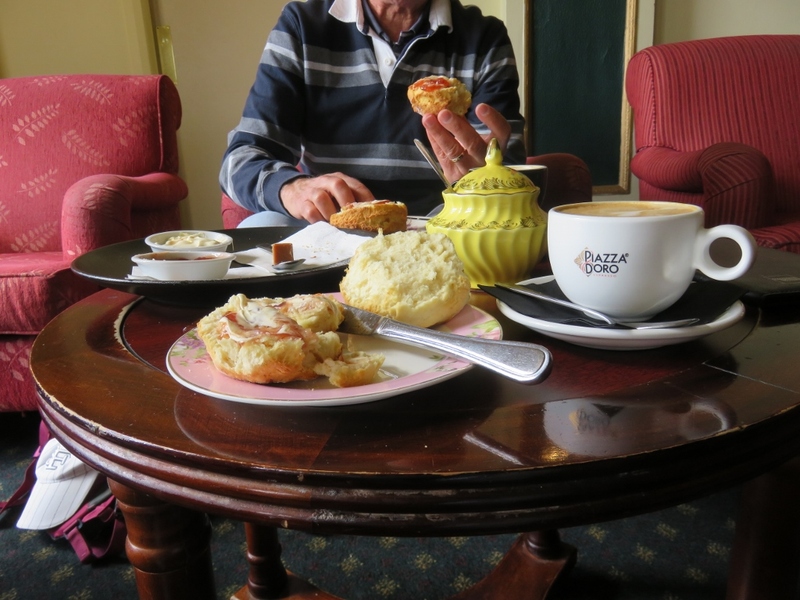 In the nature of all New Zealanders we met, the waitress was very friendly and obliging, and went off to discuss this with the boss. Very soon we were ushered us into the Emporium lounge, which surely must be kept for very special occasions during the Festival. We felt very under-dressed in our shorts and sandals….. but oh the joy of sinking into the velvet king size seats after a day of walking. What a feast! The fish and chips and salad were divine, we enjoyed more New Zealand wine,(that is becoming a theme) and we could hear ourselves talk. 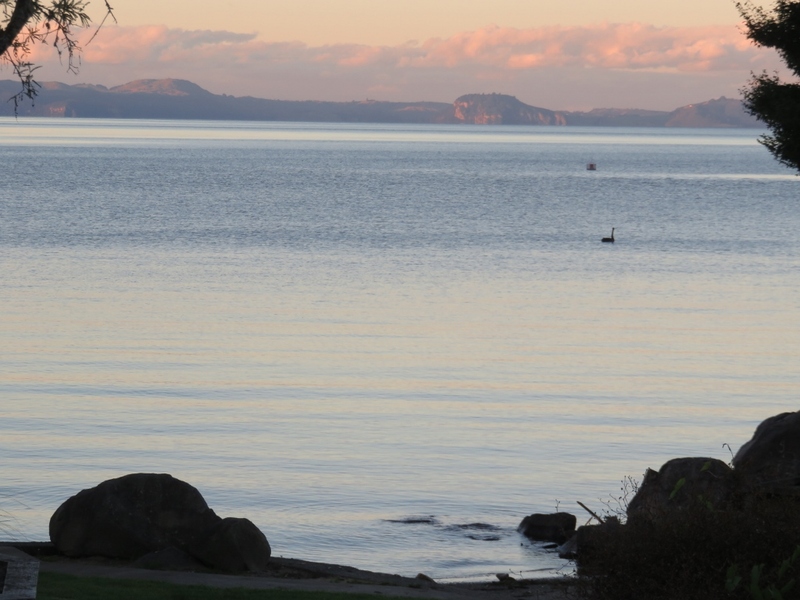 Happy (belated) Easter to everyone and hope you are having time to enjoy sunrises, sunsets and green spaces…. 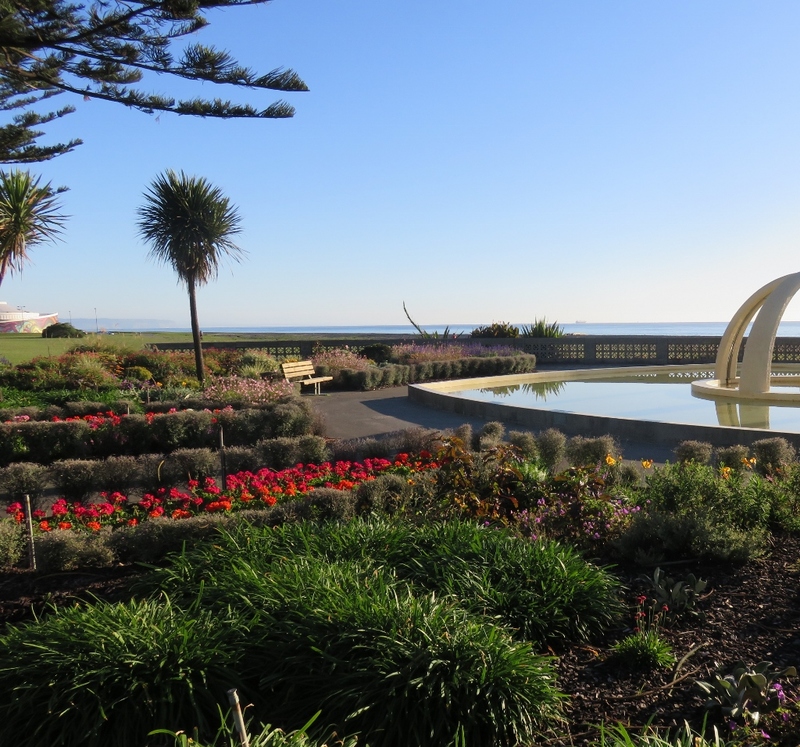 This entry was posted in New Zealand and tagged Aquarium, Art Deco, earthquakes, Emporium, fish and chips., Marine Parade Reserve, Napier, New Zealand, Parade, sculptures, seagulls, Spirit of Napier, sunken gardens, Trawlermen, Tremains Art Deco Weekend, Viewing platform, waterwheel on April 2, 2018 by germac4. 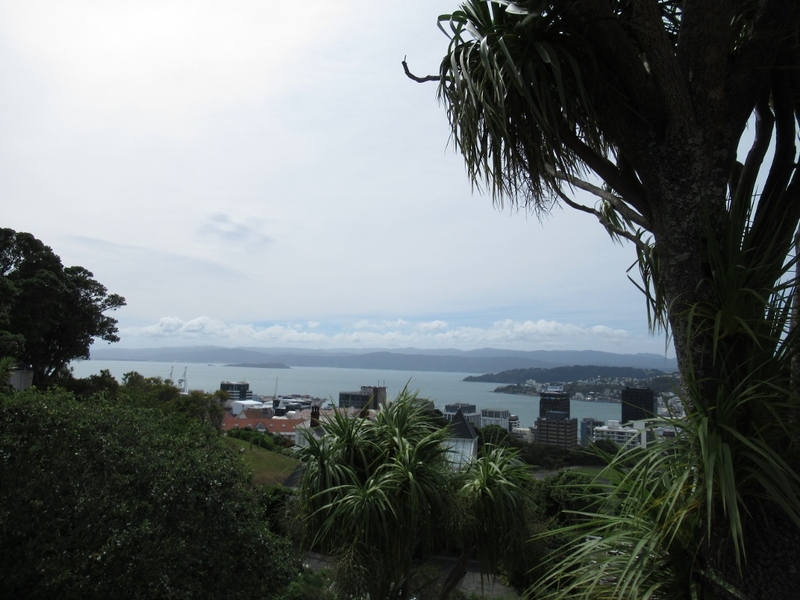 We recently visited Wellington, the capital of New Zealand, on the southern tip of the North Island. 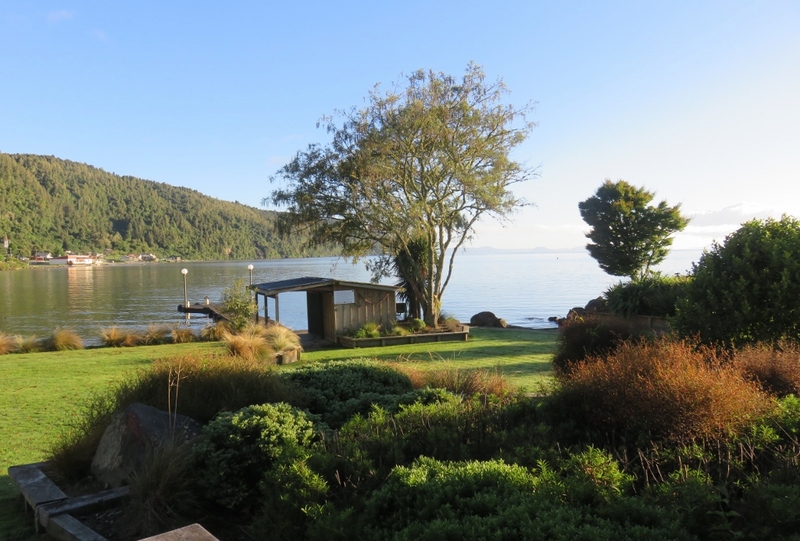 From the waterfront promenade we could see the craggy shorelines, dotted with houses and sailing boats. Just as we arrived, we heard Wellington was expecting the tail end of a cyclone that had devastated the Pacific Island of Tonga. 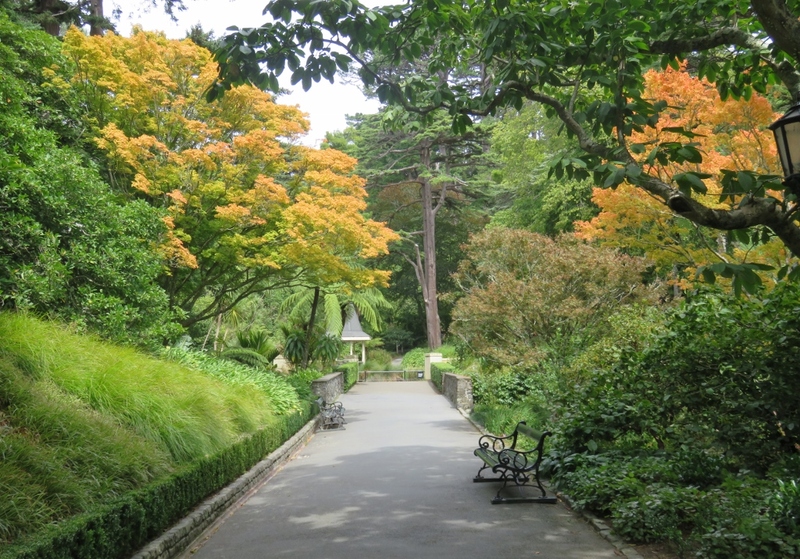 However, all was calm, and we had a few plans..
One of the attractions of the city is catching the little red cable car that clatters up the steep slope to the top of the Botanic Gardens…you can then wander down through the gardens, all the way down to the Harbour…. Paul took this photo on the way up the hill (in my view, a mountain). The weather, we had to admit, wasn’t looking great. 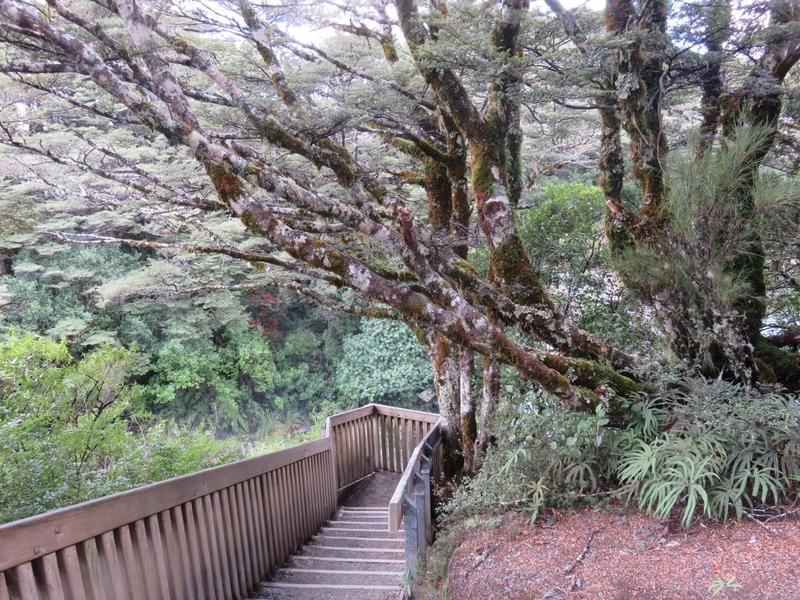 We began our Botanic garden walk in the tracks of the original forest..
As I mentioned in my last post, many parts of New Zealand were used for the filming sites for the Lord of the Rings trilogy…. 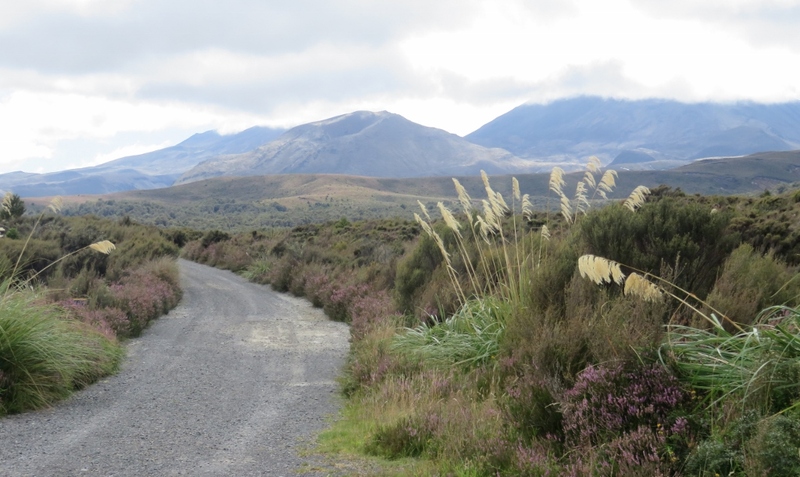 and quite often we felt we were entering Middle Earth territory…. 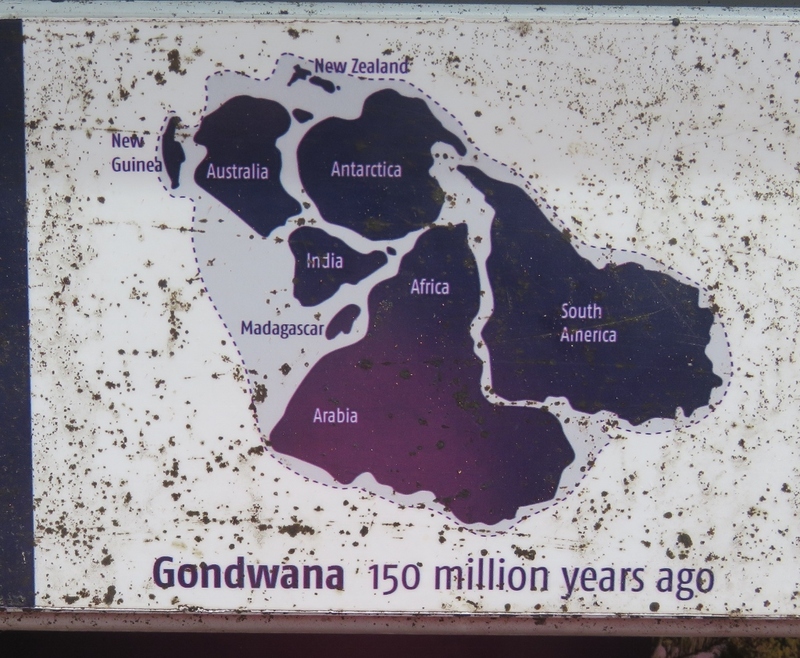 This map shows New Zealand, Australia, India, Africa, South America, and Antarctica once formed a land mass called Gondwana. 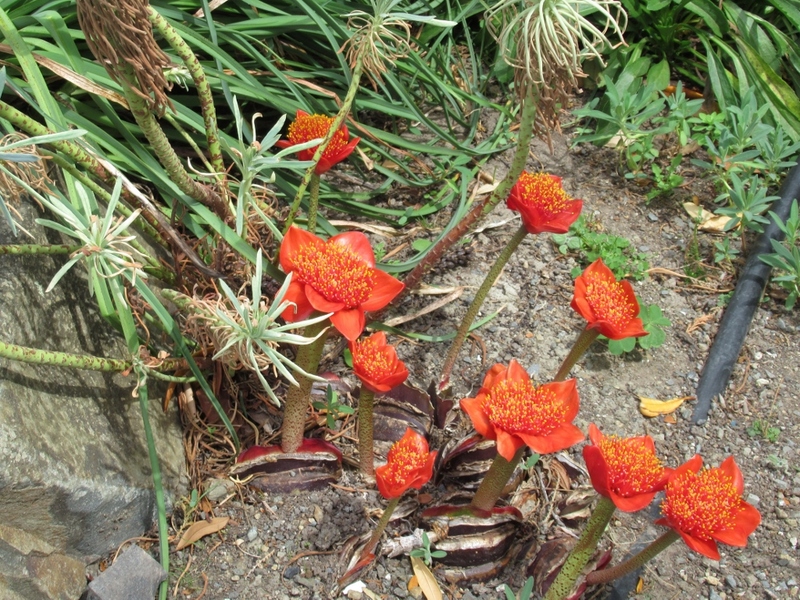 Gondwana broke up about 167 million years ago and trees from the Araucaria family were spread all over these countries and continents. 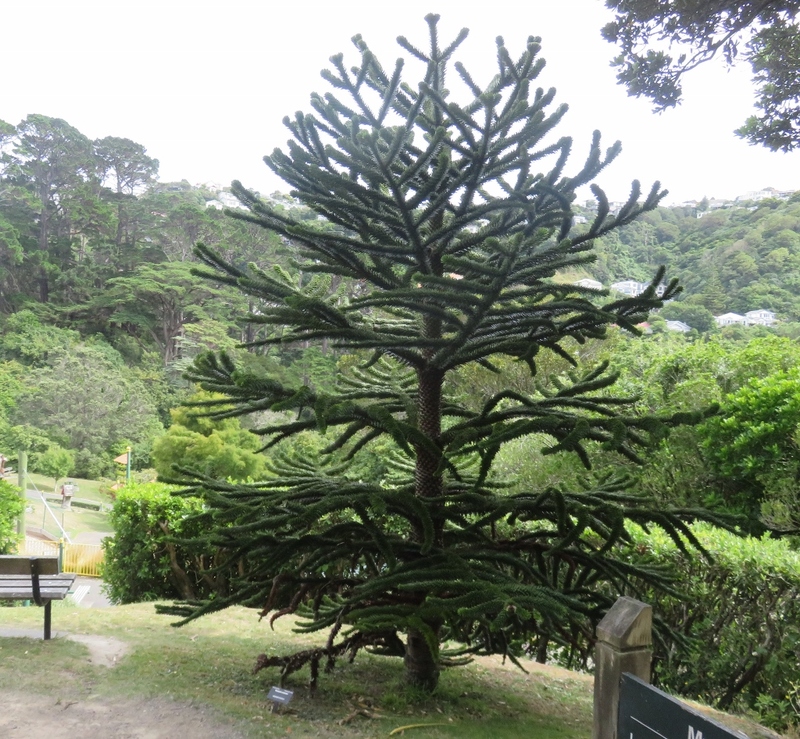 Today trees, including the South American monkey puzzle, the Australian Moreton Bay fig and the Norfolk pine, are found across the southern hemisphere. 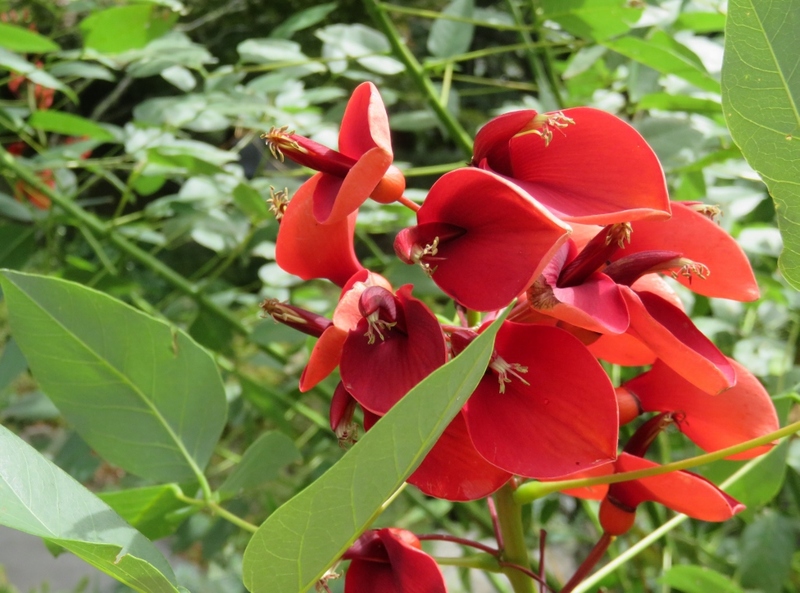 Many of these trees were found in the Botanic gardens. 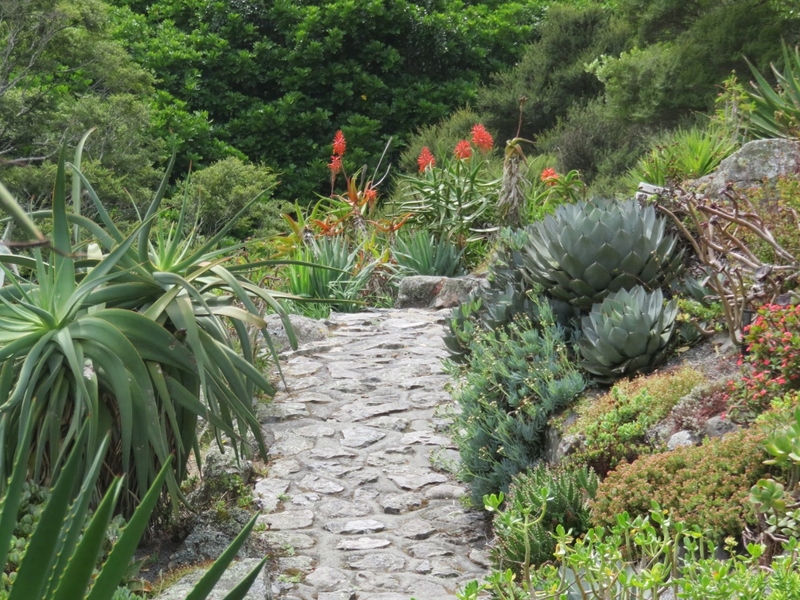 I felt as if I was in South Africa, in particular Cape Town, walking around the succulent gardens.. 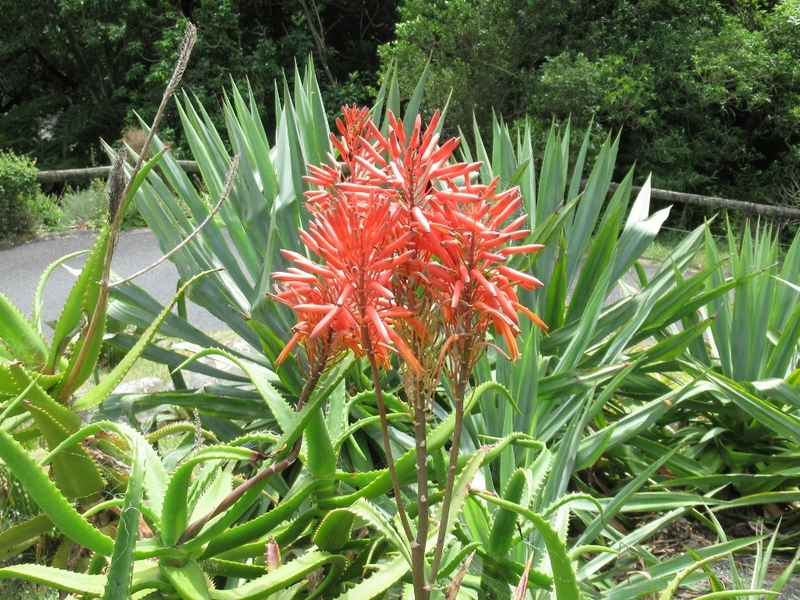 The Aloes plants are welcome source of food in winter for insects and native birds such as Tui, they love the nectar. There were bee hives tucked away in all the garden beds..
Paul took a photo from our path across to Druid Hill where we could see a large copper sculpture called Listening and Viewing Device: Andrew Drummond 1994. 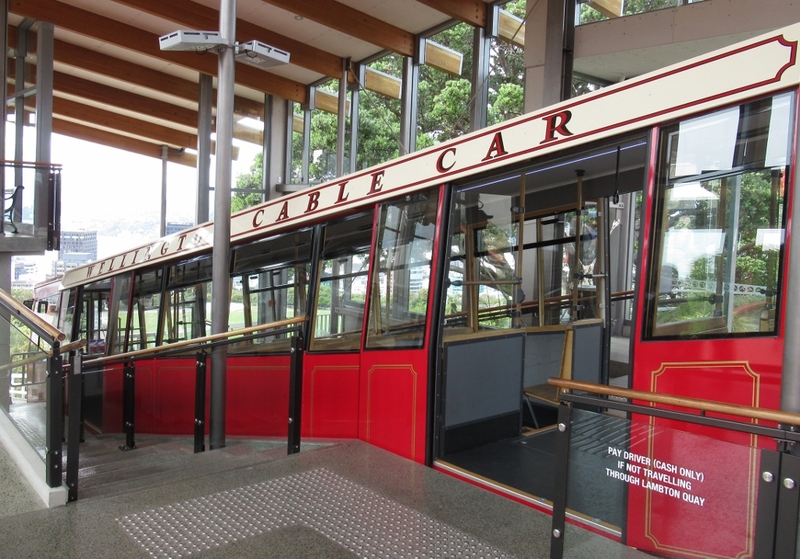 When the structure was first built, the original plan was to lift the two pieces into place by a helicopter, but the weight was more than estimated, (over a tonne) and another more heavy duty helicopter sent from New Plymouth had to finish the job! 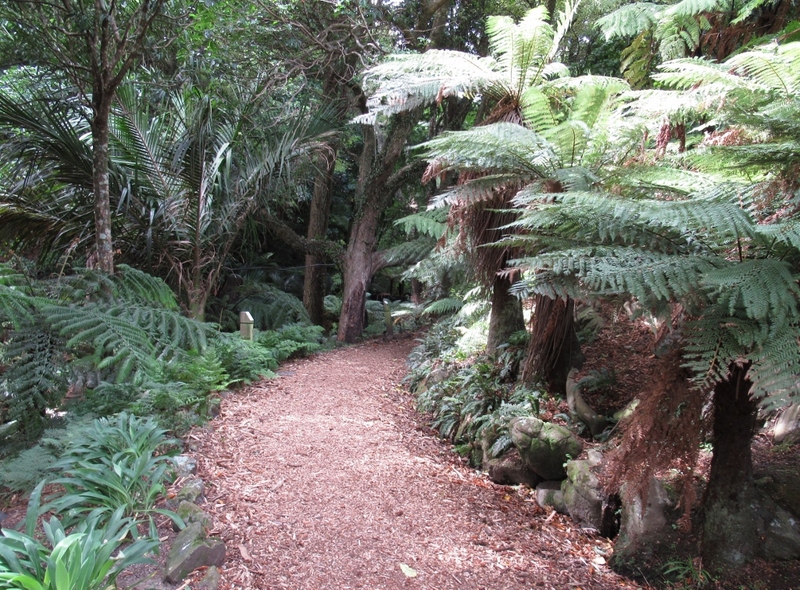 this path led on to curved shady borders of Agapanthus, Hydrangeas, Rhododendrons, Irises…sadly the flowers are mostly spent now that summer is nearly over.. 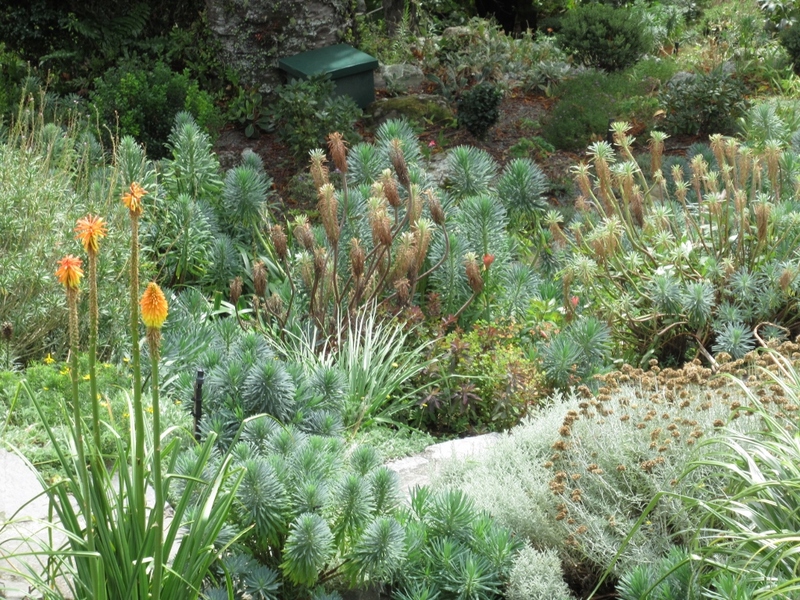 Along with the spring bulbs this must be a wonderful spring/early summer garden to visit. 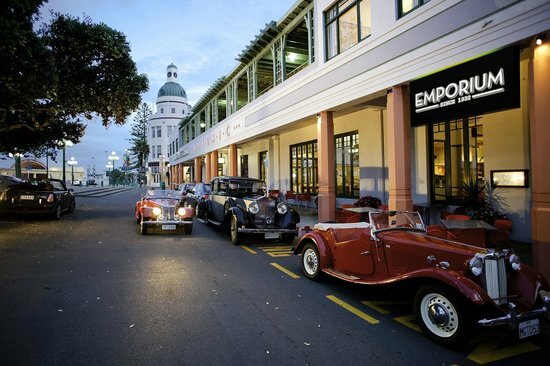 After that long and interesting walk through the gardens we felt we had earned an evening meal at the Waterfront. 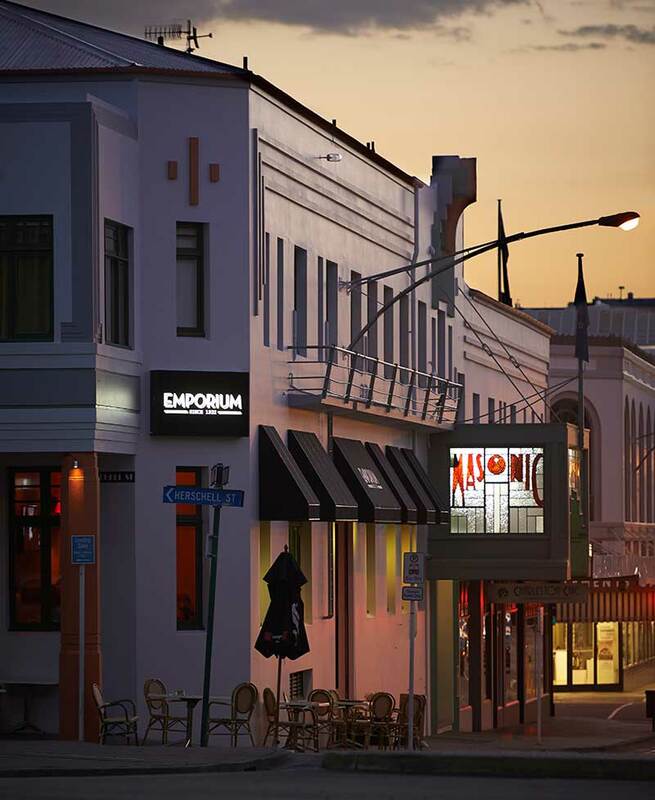 Wellington is not only the capital of New Zealand, but is also a University town, so we were spoilt for choice when it came to choosing a place to eat. 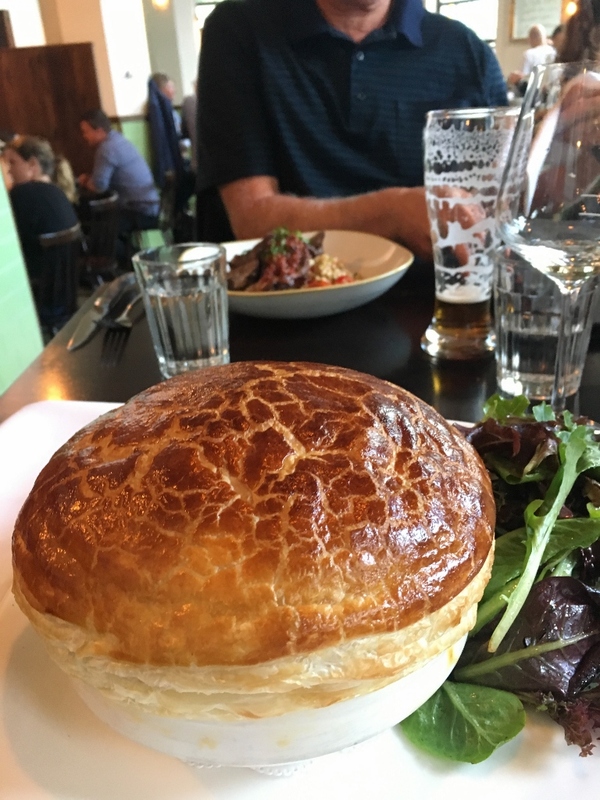 I tried the House Pot fish pie, and no, I didn’t see the word large anywhere on the menu! ….actually the pastry gently deflated into the wonderful fish dish. 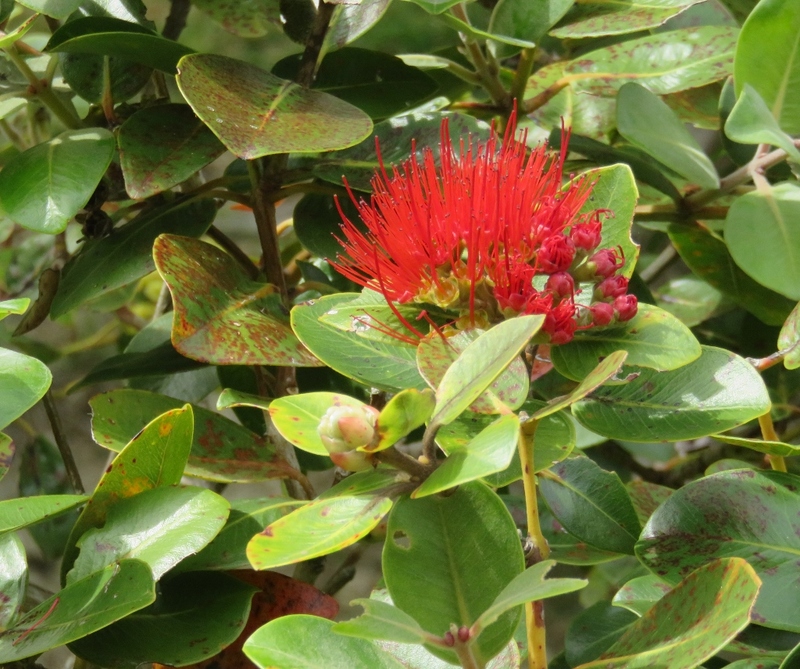 New Zealand wine and local craft beers…….. how could we resist! 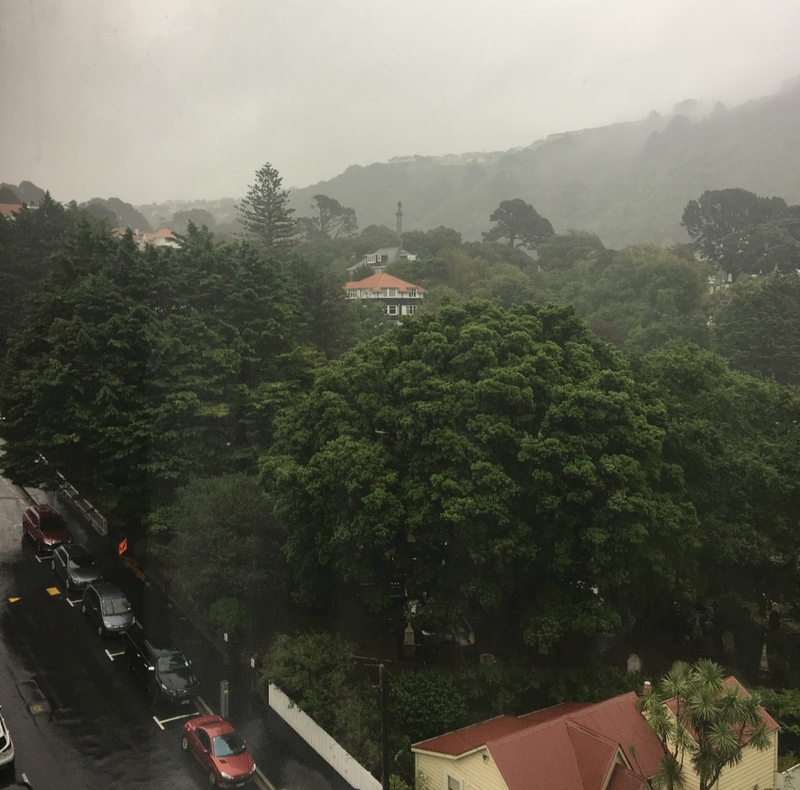 Fortunately we did enjoy our meal on the Waterfront, because the next morning, looking out of the window of our hotel room, onto the Botanic Gardens….the rain and wind from the cyclone had hit Wellington. We were hotel bound for a short while. 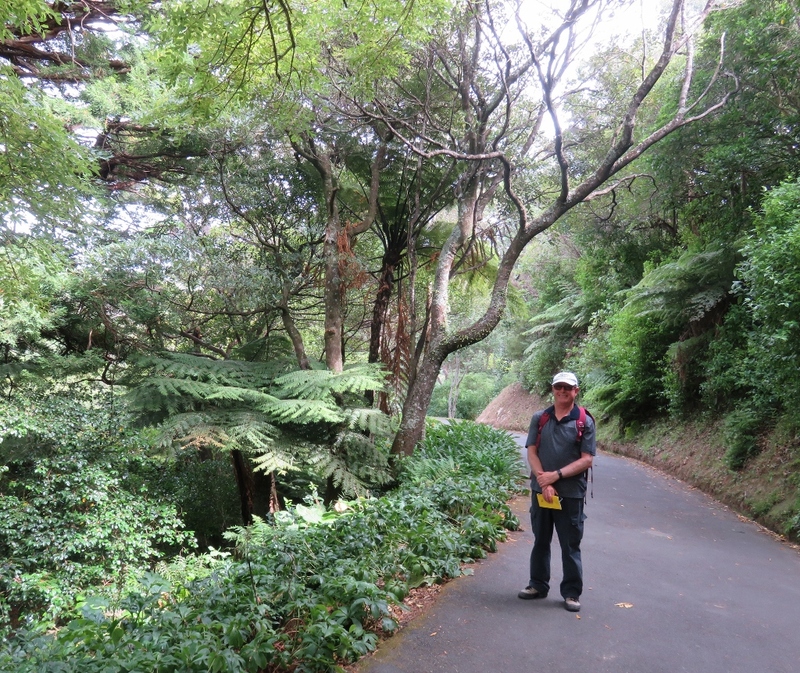 This entry was posted in New Zealand and tagged Aloes plants, bee hives, Botanic gardens, cable car, craft beers, cyclone, Druid Hill, forest, Gondwana, Listening and Viewing Device, Middle Earth, Monkey Puzzle, Moreton Bay Pine, New Zealand, Norfolk Pine, NZ wines, succulent gardens, tree ferns, Wellington, wood-fired grills on March 17, 2018 by germac4. 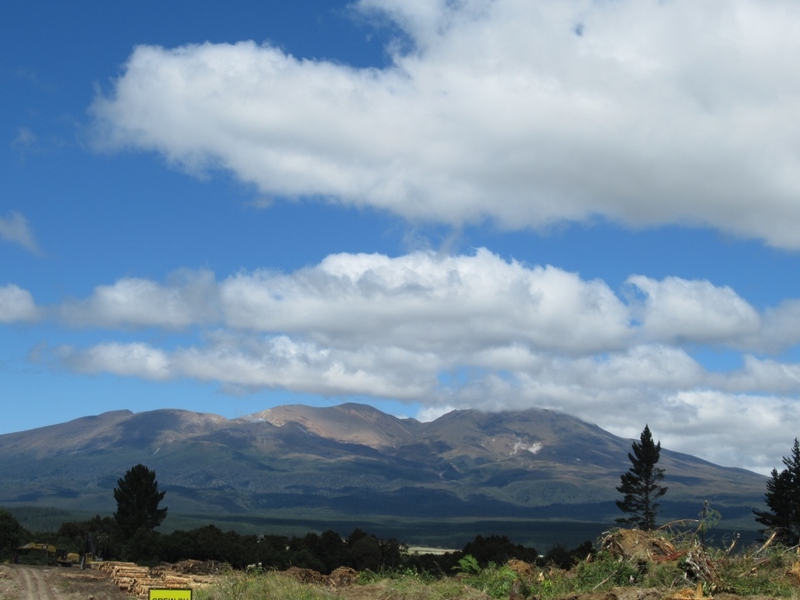 New Zealand, the land of the long white cloud.. 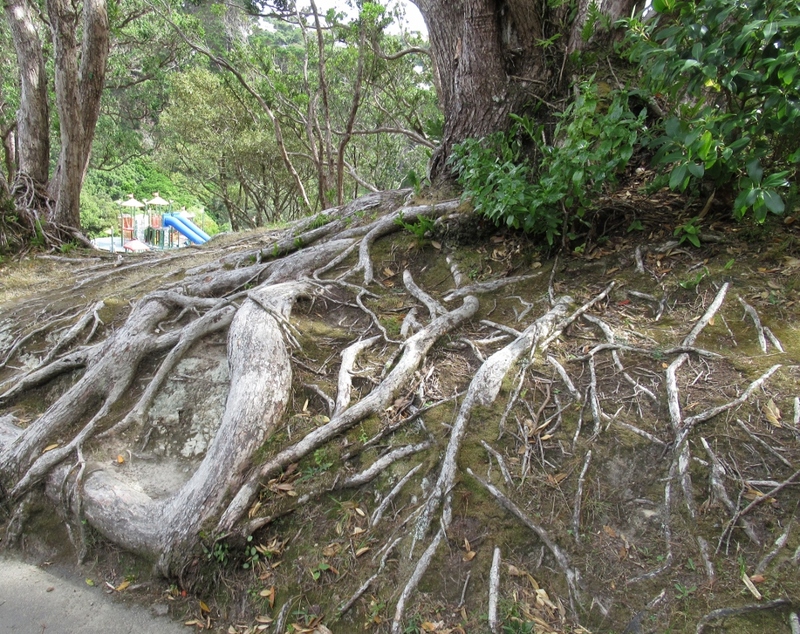 This saying is attributed to Kuramarotini, a wife of the legendary Pacific voyager Kupe, on first sighting New Zealand. On a sunny February day, we flew into the North Island of New Zealand, and Paul took this lovely photo of our first glimpse of the long white cloud. New Zealand is a three hour flight from Canberra, Australia…it is closer to us than many parts of Australia. 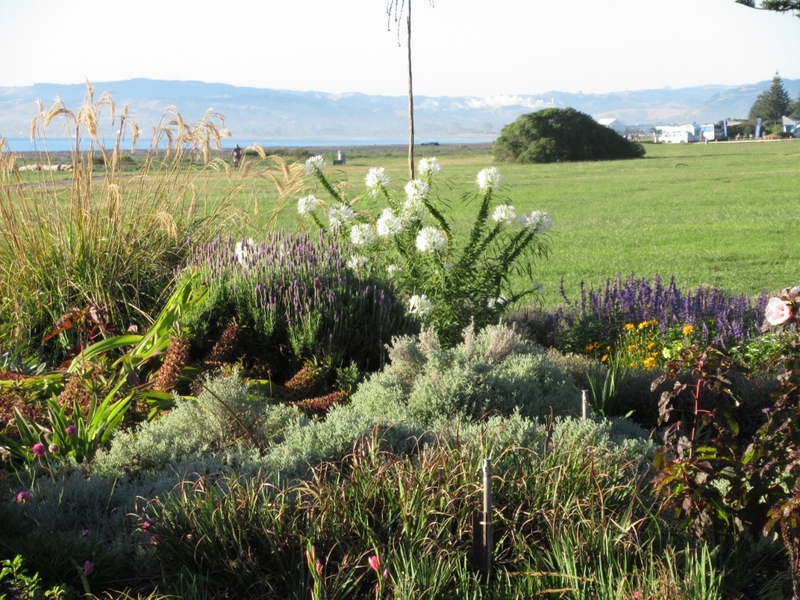 The landscape is a little like Scotland, or perhaps some parts of Europe….far far removed from the Australian landscapes. 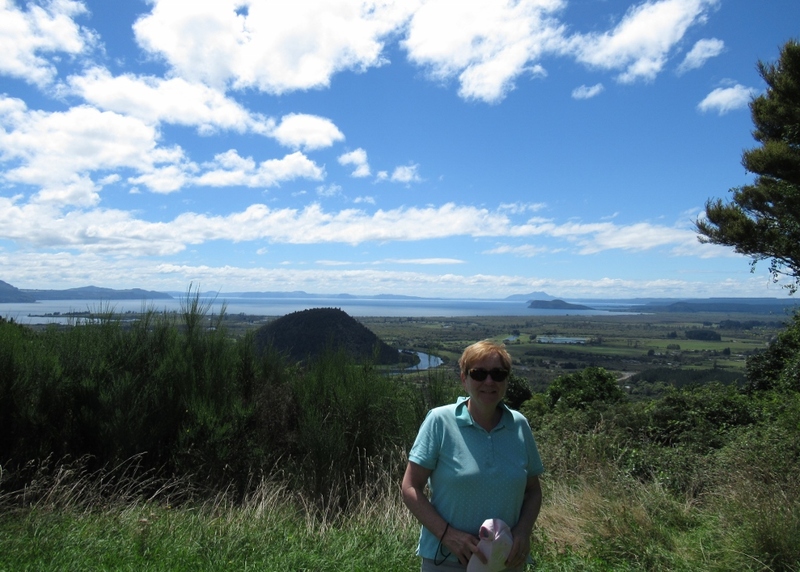 Aussies are well known for thinking hills are mountains..
We are visiting the North Island of New Zealand for our 40th wedding anniversary (amazing really….and still so young!). 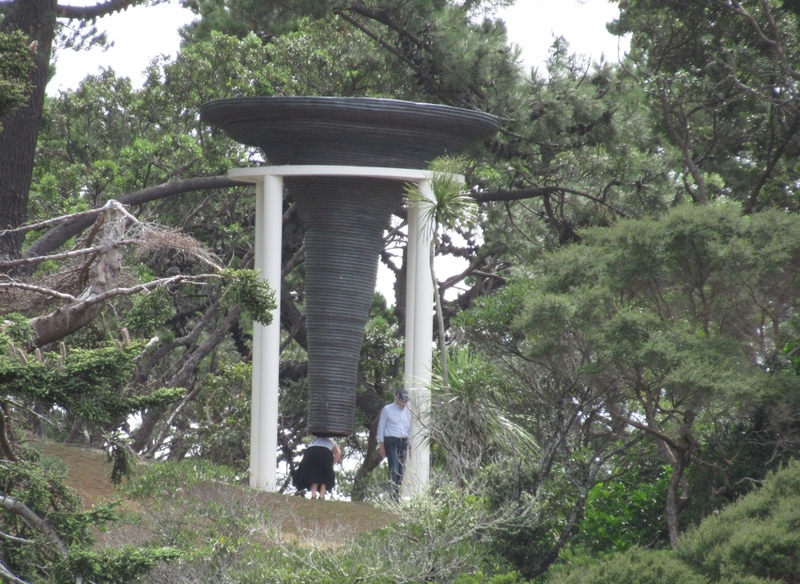 As we landed in Wellington (the capital of New Zealand) we faced the tail end of a cyclone, which had earlier devastated the Pacific Island of Tonga. However, like most potential problems in life it turned out to be less dramatic than expected. 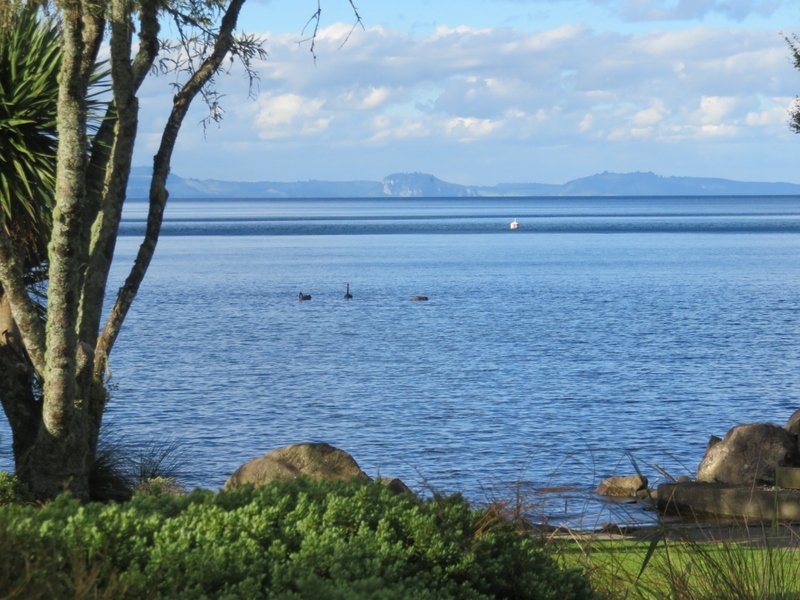 I will do a post on the interesting capital city of Wellington, but first, our absolute favourite part of the holiday, a visit to Lake Taupo. This lake (impossible to fit into one photo) was created 2 thousand years ago by a volcanic eruption so big there were recordings of it as darkening skies at that time in Europe and China. It is now the biggest lake in Australasia, and roughly the size of Singapore! ……we opted for a quiet southern end of the lake…. 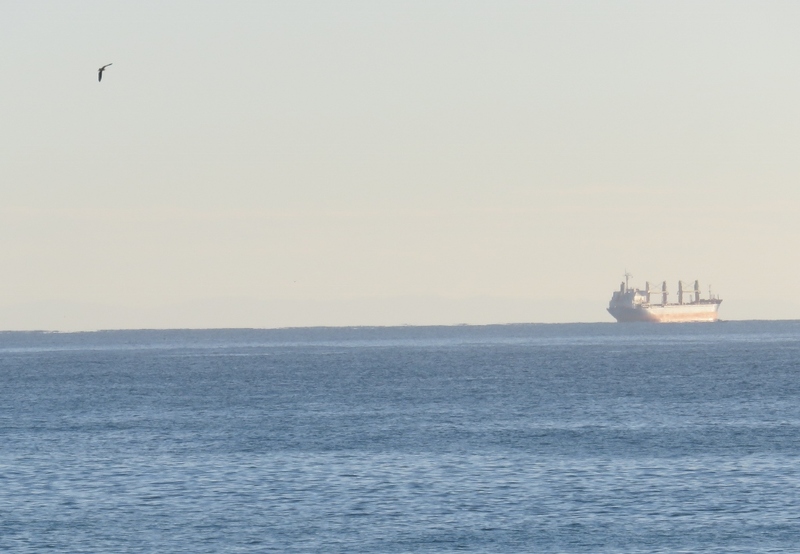 this is the view from our self-contained accommodation. Absolutely stunning view of the lake and not a jet boat in sight! 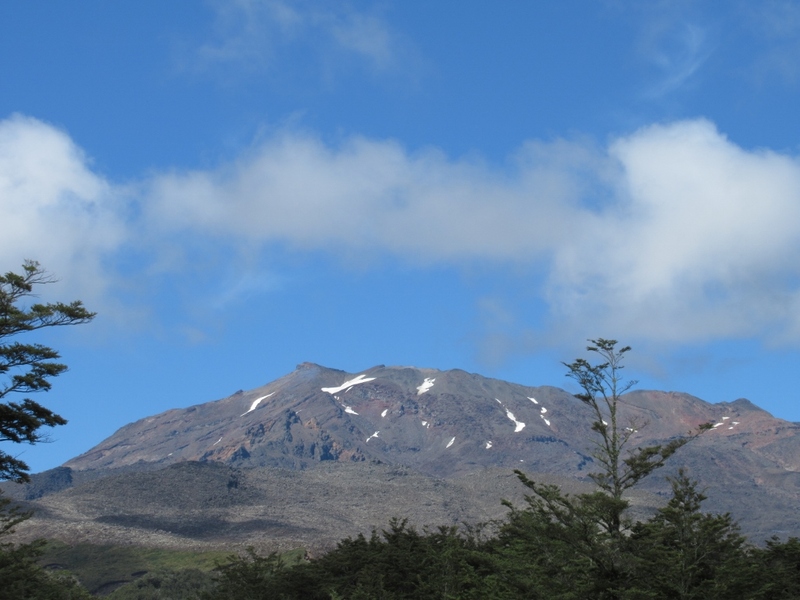 We are close to Tongariro National Park, and Mount Ruapehu…. 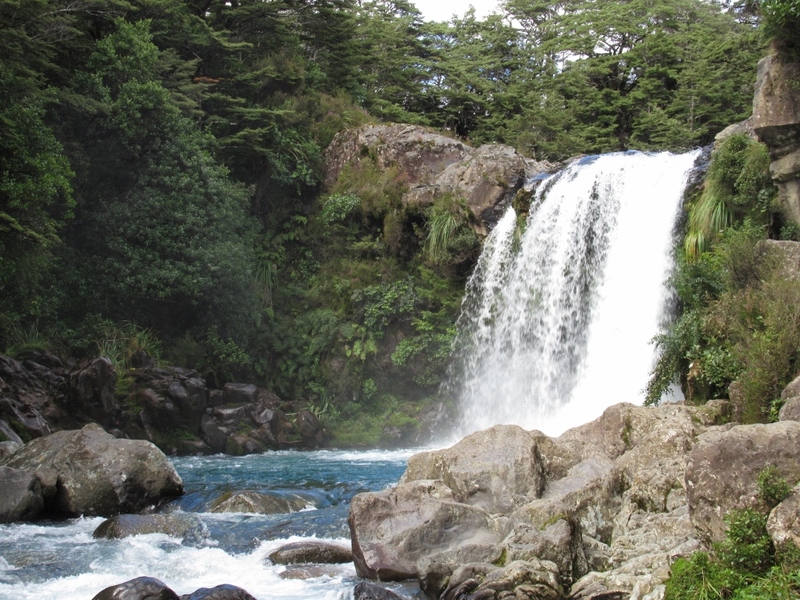 We did a shorter very beautiful walk to a waterfall…. 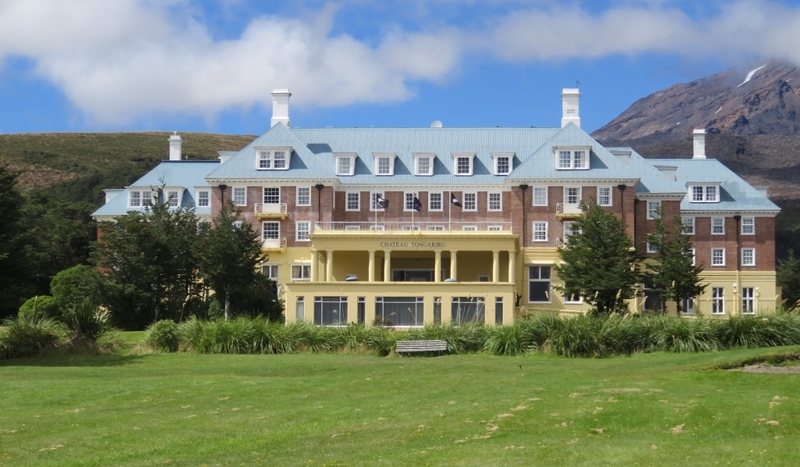 Our reward was late morning tea/coffee in the Chateau Tongariro ….a reminder of genteel bygone days. 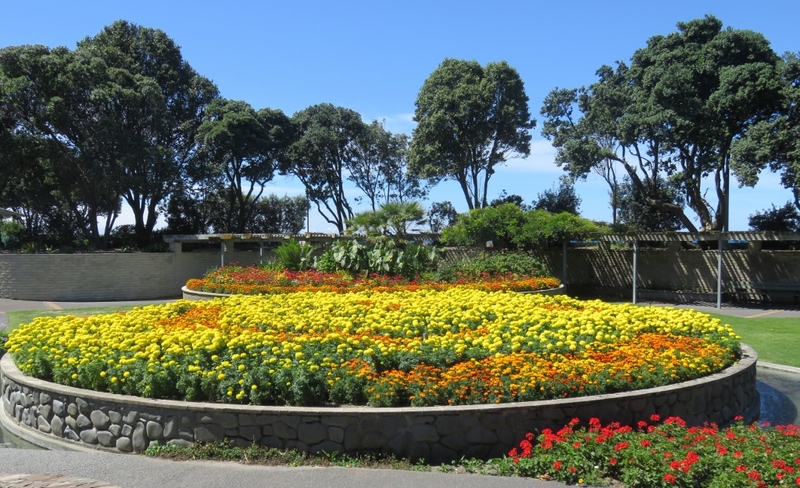 New Zealand is the land of rich and wonderful dairy produce…the cream (and ice cream) is delicious! 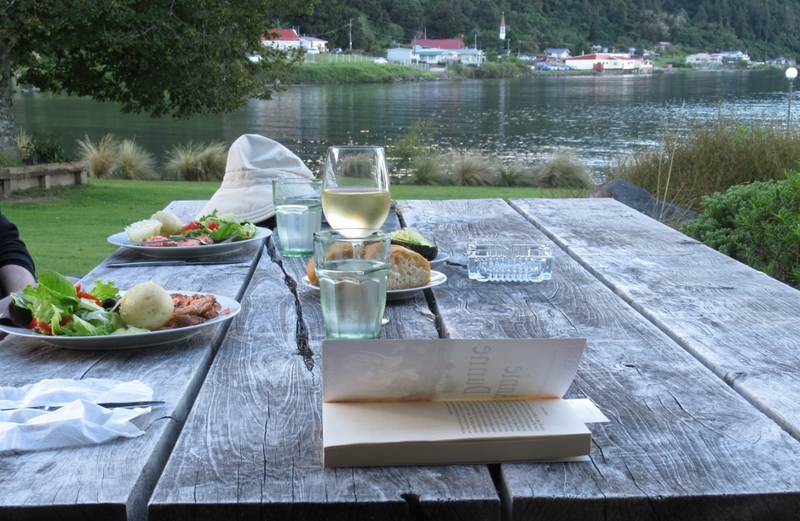 On our last evening we decided to have a meal sitting on our lovely deck, looking at the sunset..
Across the river was a small Maori village, with an elegant small church steeple just slightly in view. 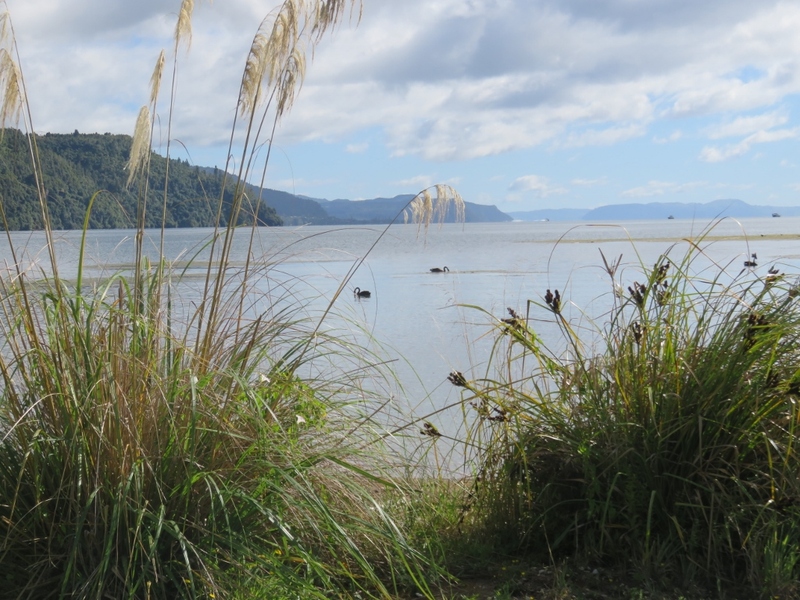 It was Sunday, and the local choir came and stood by the water, facing the church, as they sang most beautifully…..
We had smoked salmon, fresh baked potatoes and salad, locally baked bread, and some of New Zealand’s lovely wine….and our own choir.. 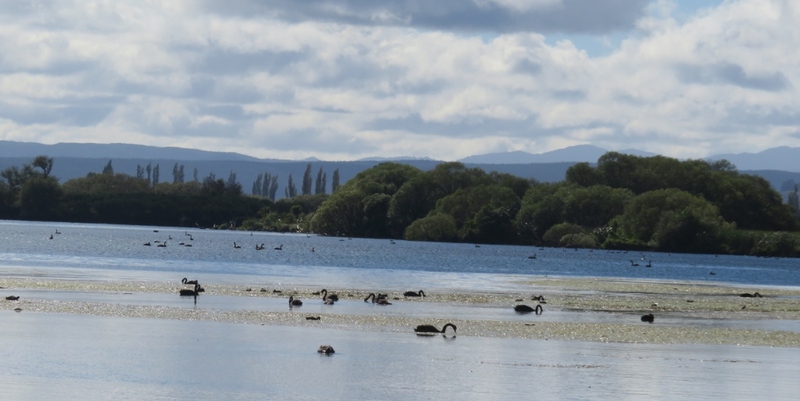 This entry was posted in New Zealand and tagged black swans Maori town choir, Chateau Tongariro, cyclone, Lake Taupo, Land of the long white cloud, Mount Ruapehu, New Zealand, North Island, Tangariro National Park, The Lord of the Rings Trilogy, volcano, Wellington on March 3, 2018 by germac4.